Do you love to make movies? Have you played around with your home cameras, but want to do more? Do you want the opportunity to see your own film on the big screen at a real movie theater? If so, TASM’s Movie Camp is for you! 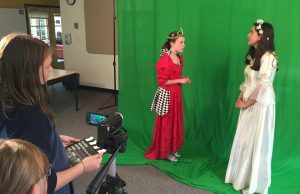 Take your movie-making ideas further than you could imagine, with professional techniques like Green Screen, Storyboarding, and a fantastic array of on-location opportunities around Newport. Campers have shot their original films in locations such as the glamorous Newport Art Museum, the historic Architect’s Inn, and the dramatic vistas of the Cliff Walk, and we have a score of others up our sleeves. In addition, we will be adding a Green Screen studio; so all our moviemakers have the chance to set their scenes wherever their imagination takes them! And don’t forget about our Red Carpet World Premiere screening at the Jane Pickens Movie Theater. There will be paparazzi and red-carpet interviews, sparkling cider and popcorn, and of course, TASM’s original movies on the big screen. It’s an event not to be missed! Our exciting two-week session offers campers the opportunity to write their own feature film and produce it from start to finish. 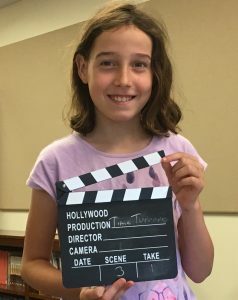 With experienced professional guidance, campers will collaborate to write an original script, compose a storyboard, and design their production. They will then act, film, and edit their original motion picture. Participants will receive professional instruction in scriptwriting, acting for video, and videography, and will have access to costumes, props and set pieces in our theatre, as well as an array of expeditions to local on-location filming sites. Campers will also have personal use of our digital video and editing equipment. Digital camcorders allow the young filmmakers to upload their footage into digital editing software, where they experience the editing process firsthand. Campers may choose to focus on acting or tech, but all campers are encouraged to try their hand at all aspects of the production. On the final day of camp, we will hold a world-premiere screening of the original motion picture at the Jane Pickens Theater & Event Center.